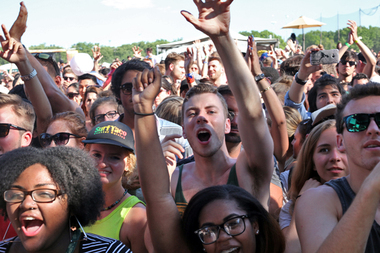 The crowd shouts and dances while Disclosure performs at Governors Ball 2014. EAST HARLEM — Fifty people who volunteered six hours at an East Harlem food bank are getting free tickets to next month’s Governors Ball music festival. A local bakery, Hot Break Kitchen, is going to be the preferred bread caterer, and more than 100 East Harlem residents are going to make $15 an hour working at the three day festival that features Drake, Lana Del Ray, and “Weird Al” Yankovic. The organizers have been working with different nonprofits, Community Board 11, and City Council Speaker Melissa Mark-Viverito to find more ways of giving back to East Harlem, which has the only footbridge to Randall’s Island. The speaker put Russell in touch with Neapolitan Express, which is going to have a truck at the festival, and local jewelry maker Nicole Romano, who will get to display her jewelry backstage for artists and VIPs, he said. The festival organizers also asked Neapolitan, who run on 100 percent clean energy, to help them make the event more environmentally friendly, Crespo added. Governors Ball wants to make Randall’s Island their permanent home and making a commitment to the neighborhood, shows how serious they are. The Parks Department did not immediately answer questions about Governors Ball's stay at the park and whether they are open to the idea of making a long-term arrangement. Apart from the temporary jobs, working with local vendors and free tickets to people who volunteer locally, Governor’s Ball is also connecting children who are interested in careers in the entertainment business with the people who are putting the festival together. After the festival, Governors Ball is sponsoring 10 East Harlem children to join the Mayor's Fund summer youth employment program. Organizers have been working with community groups since they moved the festival from Governors Island to Randall's Island in 2011, Russell said.